What could possibly be better then a pizza? Rolling it up like a cinnamon bun and slicing it into bite sizes portions you say? Well alright! Dig in to some delicious italian fun with this yummy new cooking game. A sweet pizza isn't made with the regular old marinara sauce and toppings with cheese. You make this delicious dessert pizza with jam and jelly topped with caramelized fruit and topped off with whipped cream! If you get married in the winter, you'll need to bundle up with more clothes than just lace gloves and a wedding gown. Find a form-fitting gown made from fold satin sheets for a clean bridal look among the snow flakes. Yummy oven baked and home made! This saucy pizza is a spicy surprise of your favorite traditional ingredients like peppers, olives, pepperoni, mushrooms, garlic and herbs. 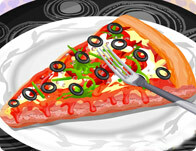 Pizza, Make the ultimate pizza using nothing but your mouse and imagination! Take your eye-opening recipe to the kitchen and roll the dough, spread the tomato sauce, sprinkle on the cheese, and load up the toppings on your own personal pizza! Give it some extra pizzazz with your own organic vegetables grown in your own backyard garden. Nothing tastes better on a pizza than fresh toppings and ingredients. Except for maybe a candy pizza! You'll always find the cool games at Girl Games, we have all the best games from game developers like i-dressup, girlsgogames and cartoon doll emporium so you will never get bored! 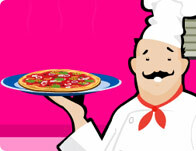 This month we have some amazing games like Papa's Pizzeria , Lush Lasagna and Cheese Casserole. New games are added every Thursday, so check back for all the latest free games online!